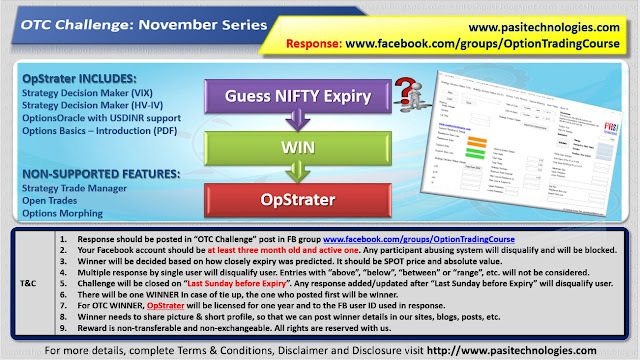 OTC Challenge for November Series is open now and will close on November 26, 2017. Oil & Natural Gas Corpn Ltd is currently trading at Rs 178.25, up by Rs 0.9 or 0.51% from its previous closing of Rs 177.35 on the BSE. The scrip opened at Rs 178.2 and has touched a high and low of Rs 182.8 and Rs 177.1 respectively. Sounds like a hell of a learning experience with you guys at Options Trading. I am so looking forward to join you guys and expand my learning curve. Thank you Blogger for such a wonderful blog. This blog is very beneficial for the beginner.